Everyone will love these hilarious birthday party games no matter what age they are! They work as birthday games for kids and birthday games for adults with a few small modifications. All you need for these fun kids birthday party games is some candy, ice cream cones, balloons, and players who are enthusiastic and ready to play! A couple of weeks ago my sister and brother-in-law came down to Texas for a couple of days to celebrate our birthdays that are just days apart. My sister is just as fun-loving as I am and pretty much always up for anything, so I decided it’d be fun to put together a couple of birthday party games to play as a family. We played these birthday party games with both kids and adults! If you’re playing these birthday games with just kids – use candy or little prizes for the games. If you’re playing these games with adults, try bigger prizes, gift cards, or even cash! So really you can play these hilarious birthday party games with pretty much anyone who likes games even if it’s a 50th birthday party! All of these games incorporate candy (or prizes) because I mean it’s a party and what kid or adult doesn’t like candy! You can use candy for prizes or get other small things as prizes for the winners instead. There’s a reason piñatas are so popular! One of my readers also suggested using dollar bills or money instead of candy and that works great as well! Before the party, fill balloons with one piece of candy each, preferably something that doesn’t really squish and fits into a balloon. Once they’re filled, blow the balloons up and tie a ribbon to the end. Give each child a balloon and help them tie it to their ankle. To play, kids have to go around the room trying to pop each other’s balloons by stomping on them. If they pop someone’s balloon, that person is out, and the person who popped the balloon gets the candy that was inside the popped balloon. It’s kind of like a balloon piñata! Last player to have an unpopped balloon wins. Make sure to have a bucket of candy for any kids who had their balloon popped without popping anyone else’s (meaning they didn’t get any candy). Let them choose one piece as a consolation prize. Small pieces of paper with silly tasks written on them such as sing I’m a little teapot, spin in a circle 10 times, recite the ABCs backwards, do 10 jumping jacks, etc. Before the party, set out a grid of ice cream cones upside down, with them lined up next to each other. Under a handful of the cones, place a couple of pieces of candy and in the other ones, place the pieces of paper with silly tasks. Make sure that you can’t see if there’s a candy or paper under each cone. 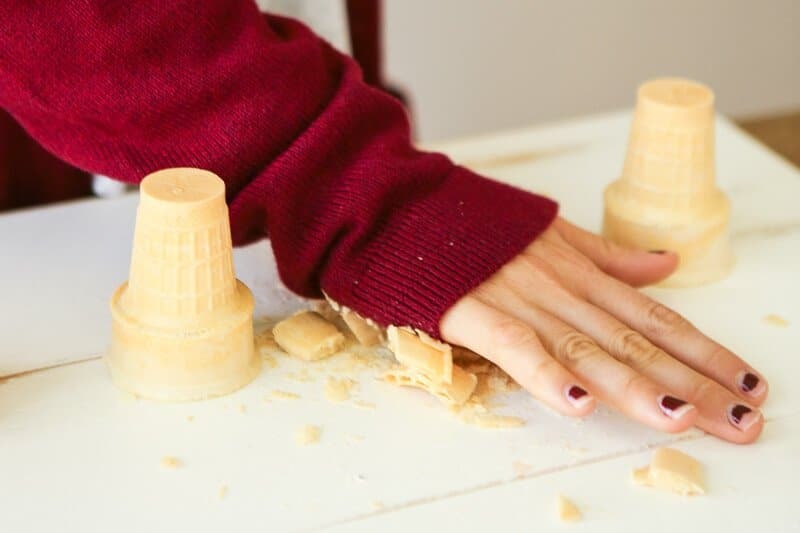 To play, kids take turns choosing an ice cream cone and smashing it softly with their hand. Make sure they don’t smash it really hard or else they’ll smash the candy inside as well. If the cone they chose to smash has a candy inside, they win the candy. If the cone they smashed has a silly task, they have to do the silly task then get back in line to try again their next turn. Kids can keep playing until all of the candy cones have been found. If you want to make it even more exciting, put a gold colored candy under only one of the cones. The person who gets the gold colored one wins a special prize. I’d skip this with young kids, but it might be great for adults!